While highly successful in basketball, football and track during his years at Abbotsford Junior and Senior schools, Simon Hoogewerf excelled in the 800 metres and became the dominant middle-distance runner in Canada. 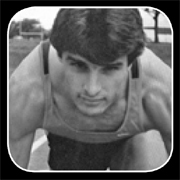 From 1981 to 1986, Hoogewerf attended the University of British Columbia where he captured a total of seven CIAU gold medals, and still holds several UBC records. During his university years, he also competed for the Canadian national team and participated in the 1984 Olympics Games in Los Angeles. After receiving his medical degree in 1986, Hoogewerf continued to compete for the next six years at the national and international level, re-establishing Canadian records in the 800 and 1500 metres. He also participated in the 1987 World Track and Field Championships in Rome, and competed in the 1988 Olympic Games in Seoul, South Korea. Hoogewerf’s career highlight was winning the 1991 bronze medal in the 800 metres at the World Indoor Track & Field Championships in Sevilla, Spain.